Are there any LaTeX package that draws/plots/generates a matrix from a "graph" description (node relations). Any type of description/language could be useful. 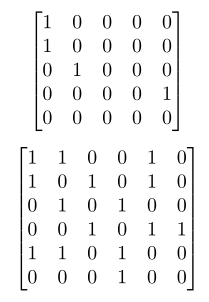 The trick is to generate automaticly a matrix from a description of "relations". Are there packages available for LaTeX to accomplish this type of "translation"? (from the mathematical relation to the matrix representation of its corresponding graph). % then place the & if not in the last column. 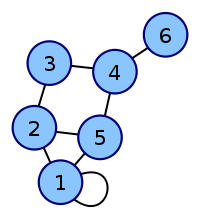 You can define and store any number of graph specifications. It would be possible to use a comma also to separate edge specifications, but I believe it's better to keep a distinction (more structure = more information). Not the answer you're looking for? Browse other questions tagged matrices graphs or ask your own question. 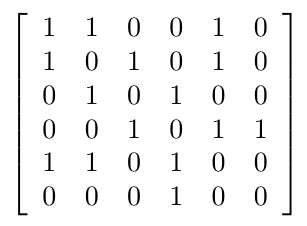 Is there a TeX-native way to generate a readable graph from an adjacency matrix? How can I write description/text beside matrix as shown? How to create Bärnighausen Trees?